A Brooklyn Museum Wedding Photographer is witness to spectacular events that vibrate with color, sound, and love. This Brooklyn Museum wedding was no different, with a grand reception in the venue’s Beaux-Arts Court. This lavishly elegant space is expansive, allowing for a wedding reception of approximately 660 guests. The Beaux-Arts Court contains the perfect combination of modern luxury and historic grace. This is especially notable in the crown jewel of the room, its glass-tile floor, which was originally placed in 1927 but has since been updated. This picture shows the bride, groom, and their guests dancing on the glass floor, captured by me, their Brooklyn Museum Wedding Photographer. The effect of the colored tiles, the glow of the pink spotlight shining over the crowd, and the dancing figures of the guests creates a watercolor-like effect. 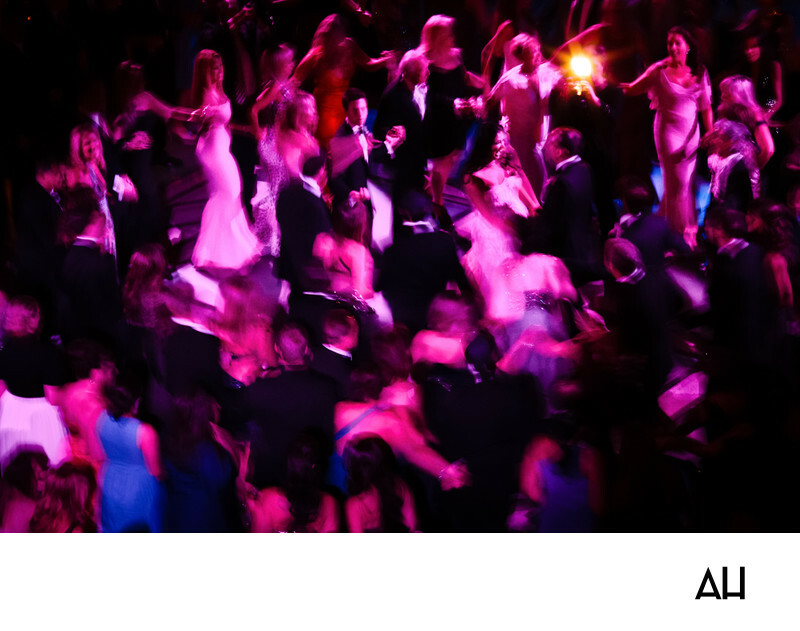 The images in the scene blur together, as those at the wedding spin around the vintage glass dance floor. The music from the band pluses throughout the scene, with the bride and groom at center celebrating. The colors of the crowd mesh together, symbolic of the union between the bride and groom and the general joy that encompassed the day. Hues of pink, blue, violet, black, and white cover the entirety of the photograph and one can almost feel the jubilation of this moment. It is pictures like this, ones that don’t focus on any one aspect of the wedding or solely on the bride and groom, that truly capture the memories of fun and friendship from the day.